Why Does Stumpy Need Surgery? On Monday, I had stage one of my stump revision surgery and I thought I would give you an explanation as to why I needed surgery, given that I have been able to do multiple Tough Mudder events. When I initially had my amputation, my calf muscle was pulled round the end of my stump to protect the bone against impact when walking/running. Unfortunately, due to the poor management of my post-operative care while at Roehampton Hospital, I contracted a large infection. 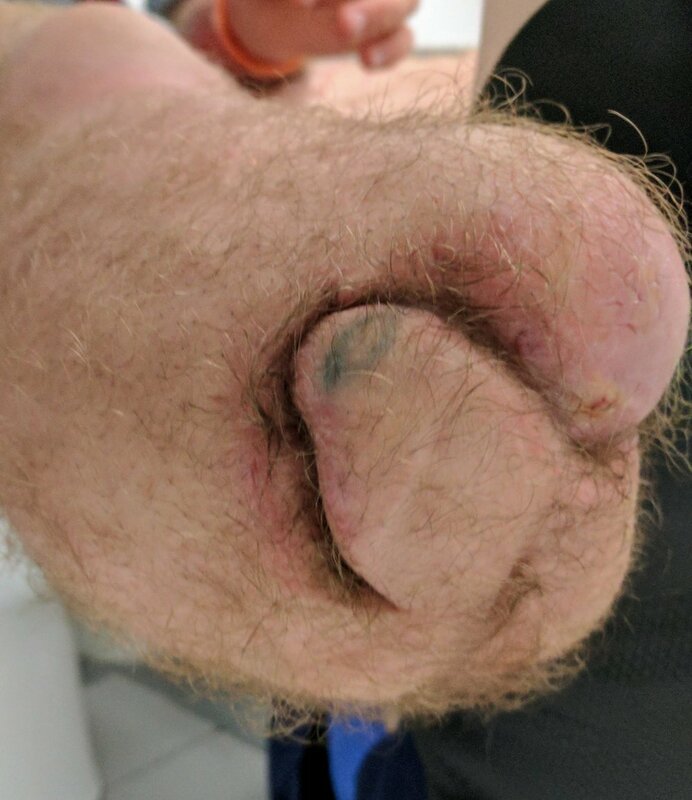 This infection, as well as a large 5cm hole in the side of my stump meant that fitting a prosthetic was very difficult at first. For months after my amputation, the calf muscle continued to fall off the end of my bone and was extremely uncomfortable. Fortunately, things started to settle after a few months however the NHS were reluctant to give me a prosthetic - hence my initial contact with the Blatchford clinic in Basingstoke. I was fitted with a prosthetic leg and as you probably know, the rest is just recent history. Despite a fantastic running blade, my stump still caused me problems and after a run, I would need to take my socket off. Running a 10-12 mile Tough Mudder could be ok however a sprint session where I would only run 200m would be extremely painful for me the next day, just due to the different type of impact. Without a muscle to protect the end on the bone, my stump took a lot of impact and would often be very swollen. As you can see in the picture, my stump was a very strange shape and it made prosthetics very difficult. In April, I had an appointment with Miss Crick, a plastic surgeon at Salisbury Hospital, who confirmed that she would be able to perform the surgery for me. After months of waiting, my surgery date arrived. Within the first stage, just a few days ago, Miss Crick opened up my stump again to expose the bone and muscle. She has left my stump open for a few days to allow it to settle before sewing it up again tomorrow. Pain-wise, things have been completely fine. I have just been having Paracetamol and Ibuprofen to settle the discomfort. After tomorrow, I believe that I will be looking at another week in hospital before returning home. I'm looking forward to the future for my stump and thank you for all of your support as I go back a step to allow me to progress further in the future.